No Al ATC (Almacén Temporal Centralizado) – Cierre De Garoña… Y De Todas Las Demás. Nuclear? No, Thank You — No To The Centralized Temporary Storage — Close Garoña… And The Rest. The sticker shows a smiling red sun on a yellow background. The sun is a global symbol of antinuclear organizations, created in 1977. As a whole, the sticker conveys the necessity to abolish nuclear energy usage in Spain and to close down power plants. When the text states its opposition to the Centralized Temporary Storage it refers to its opposition to the project’s mission to expand current nuclear waste facilities to accommodate high activity level waste from Spain, France and the UK. The sticker also calls for the closure of the power plant in Garoña, Spain’s oldest Nuclear plant that eventually shut down mid 2013. 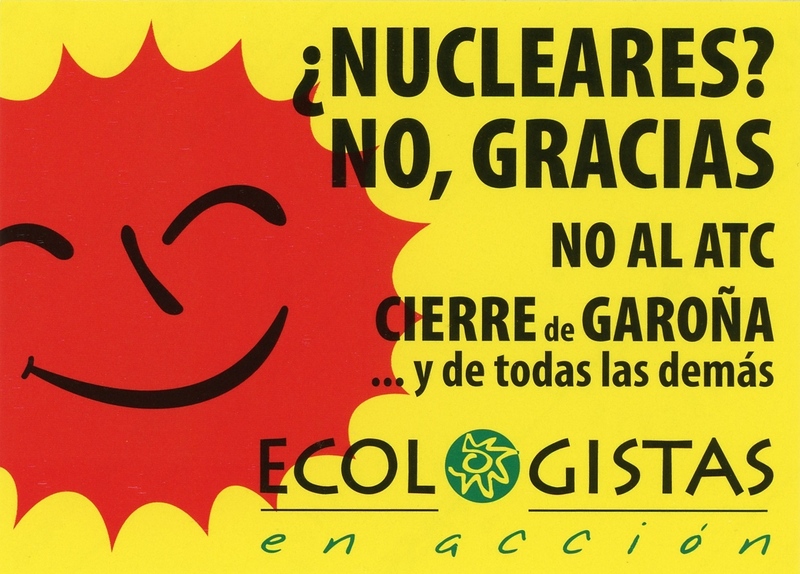 The logo for Ecologistas en Acción appears at the bottom of the sticker, and environmental organization supporting this antinuclear cause.